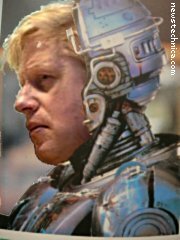 CHAP CENTRAL, Southbank, Friday (NNN) — After firing Metropolitan Police commissioner Sir Ian Blair, London mayor Boris Johnson has announced a public competition to design an iconic robot replacement. Johnson’s dismissal of Blair has been condemned from all quarters, with senior constables across the country refusing the job as too prone to political interference. “Yet again Boris has made a complete hash of things,” said Ken Livingstone, though no-one asked him.